For the last 2 years, I have been collecting Christmas fabric with the intention of using it like wrapping paper. For the last two years, I have run out of time to do this. 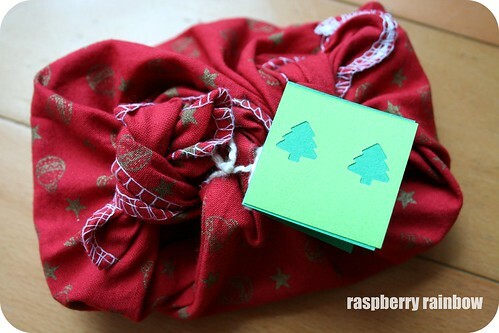 This year, I have managed to wrap some Christmas presents in fabric, Furoshiki like. I first stumbled upon Furoshiki a few years ago and ever since I have wanted to give it a try. Furoshiki is a traditional Japanese wrapping cloth used to transport gifts or other items. There is some great info on Furoshiki here and here and a video here if you want to know more. I am not using the traditional Furoshiki cloths, I have been cutting up my Christmas fabric stash and overlocking the edges. 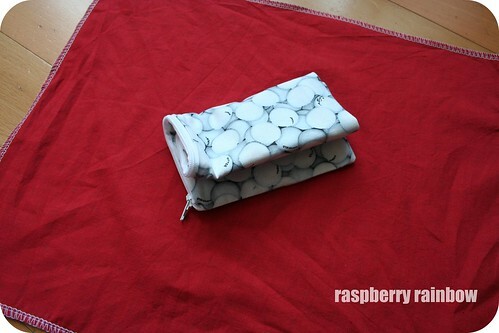 So, take one home made zip pouch, add it to a square of fabric, fold, wrap and tie the fabric. 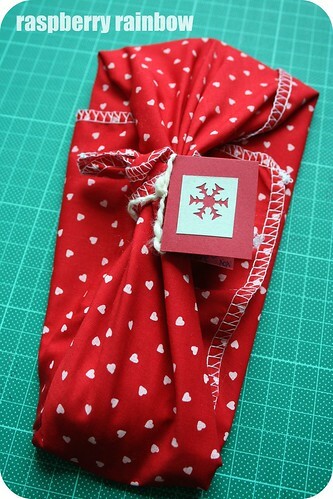 And here you have it, a hand made Christmas present, wrapped in fabric. Add a hand made gift tag if you like too. Here are a few more. 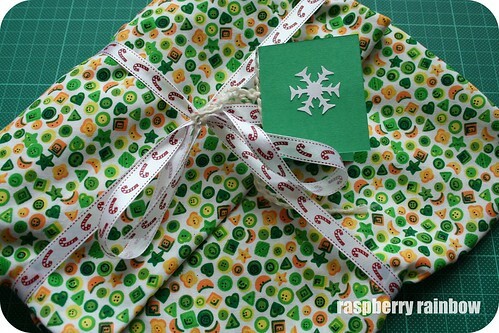 For a difficult to wrap present, I used some Christmas ribbon to fasten the fabric. 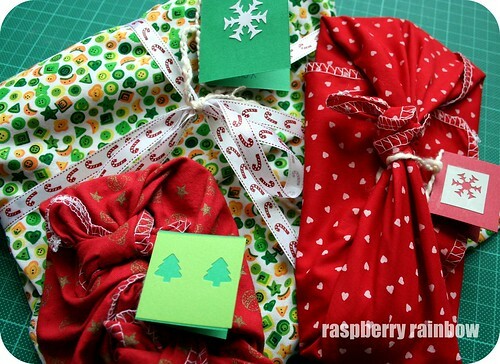 I hope to wrap many more Christmas presents this year in fabric. For me, the best bit about fabric wrapped presents is that the fabric can be used again and again. There will be a lot less paper in the rubbish or recycling. Not to mention, I found it fun to wrap using fabric. Good idea. Think I might do a bit of that too! It's an extra present to get some fabric as well! Great idea. Now I know why Goose received a few presents wrapped just like this for her Japanese themed birthday party last year!! I love the no waste wrapping idea! Our recycling bin just doesn't cope. I love wrapping presents in furoshiki! Yours looks very fun in the Christmas fabrics! wow, your pressies look great, I love the fabric you have chosen! This Moment - Her Idea.